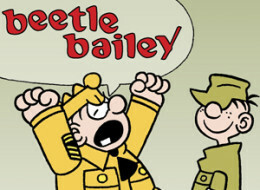 All I have to say is congratulations to Mort Walker on reaching the 60th anniversary of Beetle Bailey. He's doing what he loves and doing it well enough that he doesn't have to worry about needing to do anything else. Here's hoping I can say the same thing when I'm his age.